12 THE DOCTRINE OF CHANCES. From the foregoing problems it appears that, when A wants but one game of a set, and B two, the odds in favour of the former are 3 to 1. 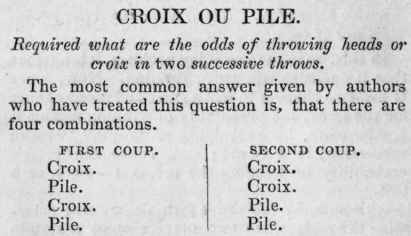 The accuracy of this calculation, however, has been questioned by the celebrated d'Alembert, who il­lustrates his position by the game of Croix ou Pile (Heads or Tail), which is too well known to need a definition.